On January 27, 2016, the Centre for Scottish and Celtic Studies and the Centre for Robert Burns Studies welcomed Professor Chris Whatley (University of Dundee) to discuss ‘Manufacturing Robert Burns, 1859-1896: George Square to Irvine Moor’. Below is this listener’s brief summary of the lecture. After Robert Burns’s death in 1796, he was celebrated and commemorated by the Scottish people in a multitude of ways. Whatley argued that Burns was the most important dead Scot during the 19th century because his influence and poetry had a particular resonance with much of the Scottish people. Because of his spontaneous popularity during this period, there were those with particular ideological and political interests who intended to hijack this movement and sought to promote and solidify his memory through permanent memorials. Up until the 1850s, the Scottish Tories and aristocrats had attempted to portray Burns as a conservative by adopting his “Cottar’s Saturday Night” as their manifesto. Monuments such as the Burns Mausoleum in Dumfries were erected, but by the 1860s these were considered inadequate by many. It was thought that these did not truly represent Burns with whom the less privileged Scots could identify. 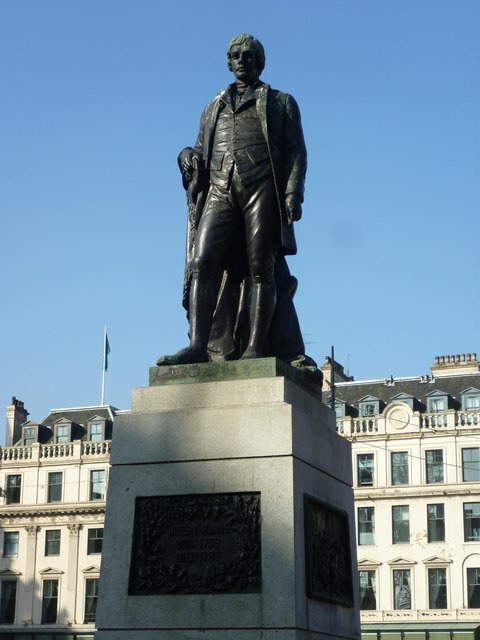 Image of the Robert Burns statue in Glasgow obtained from http://www.glasgowsculpture.com/pg_photo.php?sub=burns_georgesq&no=6. The planning of the centenary celebrations for the anniversary of Robert Burns’s birth in Glasgow in 1859 led to the proposal of the creation of a permanent memorial to Burns. 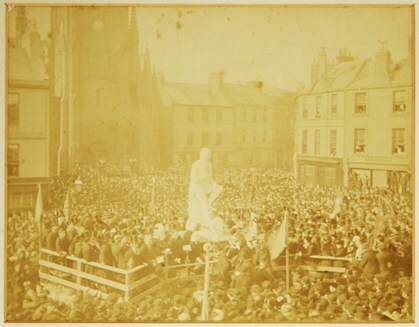 However, the statue building movement did not officially begin until 1872 after the erection of Thomas Graham’s statue in George Square, Glasgow. The process leading up to the construction of these monuments required a great deal of campaigning and fund-raising, which often led to many disputes, especially over the choosing of the sculptors and where the statue should be erected. After Glasgow commissioned their Burns statue, Kilmarnock, then Dundee and Dumfries also followed suit. Funding for the statues came from private sources, in some cases it was the lower classes that provided the most financial support. The Glasgow Burns monument committee focused on obtaining funding from the working classes to allow them a claim and vested interest in the nationality associated with the Burns monument. Other towns did the same, some even imposing a limit on how much an individual could contribute to the fund. When these statues were unveiled, they were events that caused a great deal of excitement and drew large crowds. While we know quite a bit about these processes leading to the production of these statues and have documentation from the unveiling events, we do not know as much the men who were the driving forces behind the creation of these Burns statues. Whatley revealed that the vast majority of Burns statue supporters were not aristocrats, but were self-made men of the middle class and were almost assuredly members of Burns Clubs. In Glasgow, two of the most influential Burns statue committee members were Colin Rae Brown and James Hedderwick, both of whom were editors of Glasgow newspapers; in Kilmarnock was James McKie, who had also begun a newspaper in Kilmarnock; in Dundee there was George Gilfillan and Charles Maxwell. All of them shared an evangelical belief in the moral force of the printed word. As mentioned above, many were newspaper proprietors, which were key in spreading the word and gaining support for the monuments. The ambition of Scotland’s civic leaders, who were often encouraged to join the statue committees, to produce statues because these heroic statues were seen as essential to any town to grant it civic distinction. Scotland’s civic leaders were aware of what was going on elsewhere, and knew that the lack of a statue of Burns was considered unpatriotic. Having a Burns statue in your city also had the added benefit of attracting literary tourists from England and North America. It became somewhat of an inter-town rivalry over whose statue was most unique and of the highest quality. To exert social control through cultural hegemony to influence behaviour through the emphasis of shared values across class, such as hard work, self-improvement and independence. While the middle class movers behind the monument movement had focused on engaging the working class through these statues, they had anxiety about portraying Burns as a working class hero, who loved the poor and hated the poor’s oppressors. Class hostility was still felt at the Burns statue unveiling events, and so the committee was careful to remove class out of speeches given at the events. Instead, they emphasised Burns’s beliefs in independence and self-help. From the 1880s and into the 1890s, these statues received a great deal of criticism from the public. They argued that the statues did not resemble Burns and did not inspire the working classes. In 1895, J. Pittendrigh MacGillivray was the first sculptor to use a different portrait and created the Irvine Moor Burns statue. This was considered to be worth looking at and which represents the energy, passion, and values of Burns as his audience wanted to see it. Our seminar series continues on 2 February 2016 with a series of three short seminars entitled, “An Early Medieval Miscellany,” featuring Alice Blackwell (National Museums of Scotland) to discuss ‘‘The hacksilver hoard from Gaulcross, Aberdeenshire’; Martin Cook (AOC Archaeology), to discuss ‘A recent burial find from Orkney;’ and Ewan Campbell (Glasgow), to discuss ‘Some recent early Medieval finds from Rhynie.’ This is held jointly with the First Millenia Study Group. Please note that this lecture will be held at a different time and venue than usual, in Room 407 (Lecture Theatre A) in the Boyd Orr Building and will begin at 6.00PM.